“Mina Koya’s themes are weather, health, ghosts and blessings. Her symbol is salt. The salt Goddess of the Pueblo Native Americans, Mina Koya is often venerated during autumn festivals for Her power to cleanse, protect and preserve things, including our homes and traditions. Her healing power becomes all the more important as winter’s chilly hold gets stronger. A New Mexican festival, Shalako is an all-night ritual of dancing and chanting to bless homes, commemorate the dead, bring good weather, and improve health for all participants. One tradition that honors Mina Koya and draws Her well-being into the sacred place of home is that of noise making. Take a flat-bottomed pan and sprinkle salt on it. 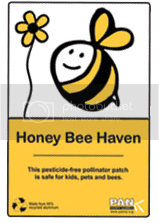 Bang this once in every room of the house (so some of the salt shakes off). This banishes negativity and evil, replacing it with Mina Koya’s blessings. To improve the effect, chant and dance afterward, sweeping up the salt and keeping it for the weather charm that follows. Or, flush the salt down the toilet to flush out any maladies. I found a lovely story on Sacred-texts.com about the Goddess of Salt that I’d like to share with you. “Between Zuni and Pescado is a steep mesa, or table-land, with fantastic rocks weathered into tower and roof-like prominences on its sides, while near it is a high natural monument of stone. Say the Zunis: The Goddess of salt was so troubled by the people who lived near Her domain on the sea-shore, and who took away Her snowy treasures without offering any sacrifice in return, that She forsook the ocean and went to live in the mountains far away. Whenever She stopped beside a pool to rest She made it salt, and She wandered so long about the great basins of the West that much of the water in them is bitter, and the yield of salt from the larger lake near Zuni brings into the Zuni treasury large tolls from other tribes that draw from it. Here She met the turquoise god, who fell in love with Her at sight, and wooed so warmly that She accepted and married him. For a time they lived happily, but when the people learned that the Goddess had concealed Herself among the mountains of New Mexico they followed Her to that land and troubled Her again until She declared that She would leave their view forever. Native American Mythology A to Z, “Salt Woman“. Preservationnation.org, “Zuni Salt Lake and Sanctuary Zone“. Schubert, Rebecca. Zunispirits.com, “The Salt Woman“. Skinnner, Charles M. Sacred-texts.com, “Goddess of Salt“. Bastian, Dawn Elaine & Judy K. Mitchel. Handbook of Native American Mythology, “Salt Woman“. Skinner, Charles M. Myths and Legends of Our Own Land, Vol. 2, “Goddess of Salt“. St. Clair, Jeffrey. Counterpunch.org, “The Battle for Zuni Salt Lake“. “Yellow Woman’s themes are nature, providence and animals. 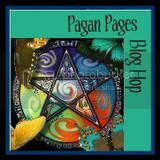 Her symbols are yellow items, green items and embroidered items. This Pueblo Goddess of magic, agriculture and the hunt is also the heroine of many local stories, having taught humans important sacred ceremonies. Today She helps us remember these rituals and reintegrate the into our lives. 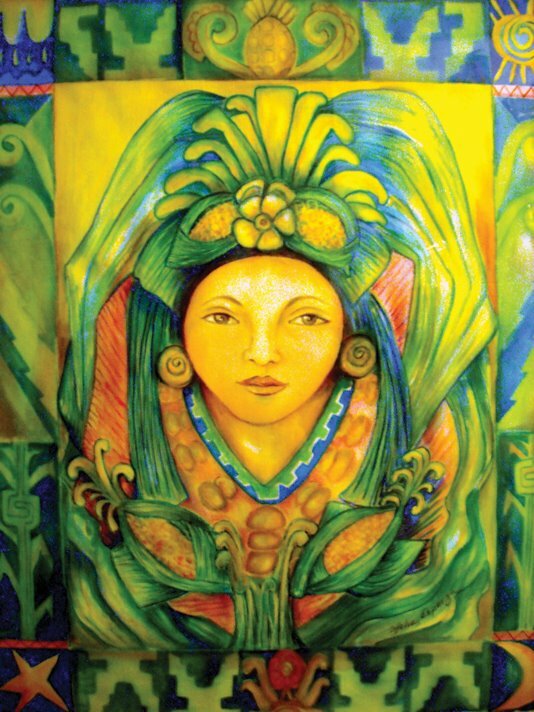 Art depicts Yellow Woman wearing an embroidered blanket-dress, a green mask (revealing Her connection to nature), and a white mantle. Sometimes She appears as a Corn Goddess and other times as a witch, bear, or ogress. Americanindianoriginals.com, “Kachina Dolls: Their Meaning and Tribal Development – Corn Maiden Kachina Doll“. Marashinsky, Amy Sophia. The Goddess Oracle, “Corn Woman“. Jukiewicz, Carol E. Groups.yahoo.com/group/indigenous_peoples_literature, “[indigenous_peoples_literature] Yellow Woman stories“. Kachina-doll-shop.com, “Kachina Names & Meanings“. Nagoda-Bergquist, Susi. Coyoteandanotherone.com, “Yellow Woman, The Moon“. Redaspen.blogspot.com, “Evil Kachina and Yellow Corn Woman“. Silko, Leslie Marmon. Yellow Woman. “Selu’s themes are the harvest, the weather and growth. Her symbol is corn. This Southeastern Native American corn Goddess planted Her very heart so people wouldn’t go hungry. Corn sprouted from it. To this day, Her spirit teaches us how to refertilize the earth to bring us the sustenance we need. In this primary festival (the Fiesta de Santa Clara) among the Pueblo Native Americans, Santa Clara replaced Selu, the spirit of the corn, when Christianity took hold. For the Pueblo, corn is a staple, so as the sun reigns in power they dance for rain and evoke the Corn Spirit for every portion of the crop’s growth. Following this tradition, if it’s raining today, go outside and rejoice in Selu’s growth-related energy. Dance with a bit of cron (or eat some beforehand) to invoke her powers for progress in any area of your life. “Selu is the Cherokee (Tsalagi language) name for the Corn Mother who is worshiped by nearly all Native American tribes. She is called by many names but almost all literally translate to ‘Corn Mother’ ‘Corn Maiden’ or ‘Corn Woman’ (see my July 2 entry on “Corn Mother“). Often the name the Corn Mother Goddess is known by is used as the common word for ‘corn’ as well. Selu is the Goddess of the Harvest of course, but also wisdom, magic, hunting (as the wife of Kanati the God of the Hunt,) and various other domains. She was often the most honored ‘Mother’ Goddess among many tribes including the Cherokee. The Aztec called her Chicomecoatl and She was their the Goddess of Corn and of all Fertility (of crops, livestock, wild animals, and people’s own fertility. )During one month the Goddess of ‘maize’ (Corn) was the patron deity in the religious celebrations. The main corn blessing rite was led by many Priestesses each carrying seven ears of corn wrapped in fancy cloth on their backs, wearing fancy make-up and feather decorated dresses. At the setting of the sun the Priestesses threw colored corn into the crowds, symbolizing the Corn Goddess Chicomecoatl’s blessing the tribe with fertility for the coming harvest season. As the men prepared for the Thanksgiving Dance that night the Creator came to the Shaman. She told him to do something unbelievable. She told him to bury all of the women. Furthermore, She directed for the women to be buried together in a single shallow grave. The next morning all of the woman were buried as directed by the Mother Goddess. That night, the men and the children danced the Thanksgiving Dance with heavy hearts. The Creator caused a great sleep to come over the village and sent a wonderful God to the village. The God was tall handsome and entertaining comical fellow who played a flute. He went to the grave and started to play his flute. He bent over the grave and as he played, tears feel from his eyes. These tears became seeds of corn as he played and cried. At the end of 20 sunsets our Creator said to him, ‘Kokopelli, you shall forever remain hunched over as a tribute to the maidens who will forever be known as the Corn Women. Your tears of sympathy have become seeds of lifegiving corn. Cyber Temples of the Gods, “Selu’s (the Corn Mother’s) Temple“. 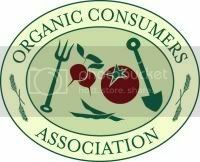 Britannica Online Encyclopedia, “Corn Mother“. First People – the Legends, “Corn Mother – Penobscot“. Goddessrealm.com, “Corn Mother Goddess of Nourishment“. Goddesses and Gods, “Goddess Corn Mother“. Hrana Janto, Illustration & Illumination, “Corn Maiden“. Native-languages.org, “Legendary Native American Figures: Selu“. Raine, Lauren. Threads of the Spiderwoman, “Corn Mother and Collaboration“. Sidhe, Fiana. Matrifocus, “Goddess in the Wheel of the Year – The Corn Mother“. Tanith. Order of the White Moon, “Corn Woman, Goddess of Nourishment“. Two Worlds, Waynonaha. Weed Wanderings, “Wise Woman Wisdom…Corn Woman“. Nuvak’chin Mana’s themes are ghosts (spirits), blessings, weather and winter. Her symbols are cold items, white, and moisture. This Goddess’s name means ‘Snow Maiden’. In the Niman Festival, Nuvak’chin Mana is a kachina who appears to pray for the return of cold weather so the moisture in the earth gets replenished. In our lives, She comes to replenish the well of our spirits and cool any overheated tempers that erupt with summer’s heat. In Hopi tradition, Kachinas are spirits that help the tribe in all matters of life. Each year the Kachinas emerge around February to remind people of their blessings and to teach the sacred rituals that bring rain. Around this time of year, the Kachinas return to their rest, escorted out of the human realms by the Niman ritual. To bring Nuvak’chin Mana’s coolheadedness and refreshing energy to your entire day, drink a glass of milk on the rocks at breakfast, lunch and dinner (or anytime in between). It’s very refreshing and the appearance of the beverage honors the Goddess. If your region has been suffering from a dry spell, pour out a little of the milk and ice on the ground as an offering to Nuvak’chin Mana so She might carry your need for rain to the nature spirits. According to Heather Marseillan: “Shortly after Summer Solstice each year the Hopi ceremony called the Niman Kachina, also known as ‘The Going Home of the Kachina’ or ‘The Niman Festival’ will begin. Typically this Native American festival starts 4-5 days after the solstice and runs for about sixteen days. It is a very important time for the Hopi and they still celebrate it today. The Niman Kachina is more or less a drawn out good bye ceremony to the winter and spring Kachinas. The Kachia are a spirits in the western Pueblo cosmology and religious practices of the Native American Tribes of the region. Western Pueblo, Native American cultures which are located in the southwestern region of the United States, include the Hopi, Zuni, Tewa Village, Acoma Pueblo, and the Laguna Pueblo. The Kachina has spread to the more eastern Pueblos as well. Marseillan, Heather. Examiner.com, “Niman Kachina Festival“. Teyjah. Art in Petroglyphs by Teyjah, “Nuvak’ Chin Mana Kachina“. “Iyatiku’s themes are Earth, the harvest, providence, health and weather. Her symbols are corn, beans, seeds and soil. Iyatiku is the Pueblo corn and underworld Goddess who protects not only future crops but the future in general by safeguarding children. During the early months of the year, Iyatiku extends arms of compassion to embrace us with nurturing support, just as the earth nurtures seeds. If you have a garden, today is an excellent time to dance on the land and invoke Iyatiku’s blessings on your crops or flowers. The Pueblo and Hopi Indians have spirit dancers waltz around the land to instill the crops with energy through sacred movements. The Hopi also plant beans on top of underground ritual rooms called kivas, which house Iyatiku’s nurturing energy. When children go into kivas for rites of passage, they emerge as adults thanks to the Goddess’s care and guidance within. Click here for further information on Her titles and variants. “Spider Woman’s themes are magical charms and growth. Her symbols are spiders and woven items. 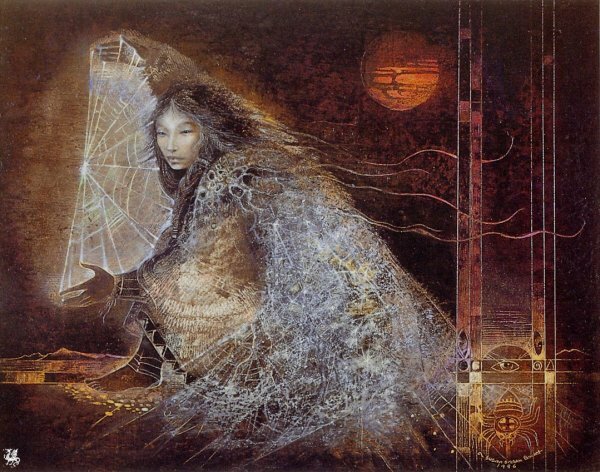 Spider Woman appears in the myths of the south-western Native Americans as a resourceful helper who spins magical charms and each person’s fate. No matter what problems or obstacles you face, Spider Woman creates the right network of energy to put you on the road toward accomplishment. In metaphysical traditions, all life is seen as a network within which each individual is one strand. 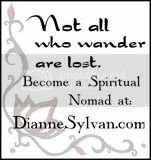 Spider Woman reveals the power and purpose of each strand psychically and keeps you aware of those important connections in your life. To augment this, get a Native American dream catcher, which looks like a web, and hang it over your bed so Spider Woman can reveal her lessons while you sleep. Or, carry a woven item with you today. It will strengthen your relationship with this ancient helpmate and extend positive energy for success in all you do. 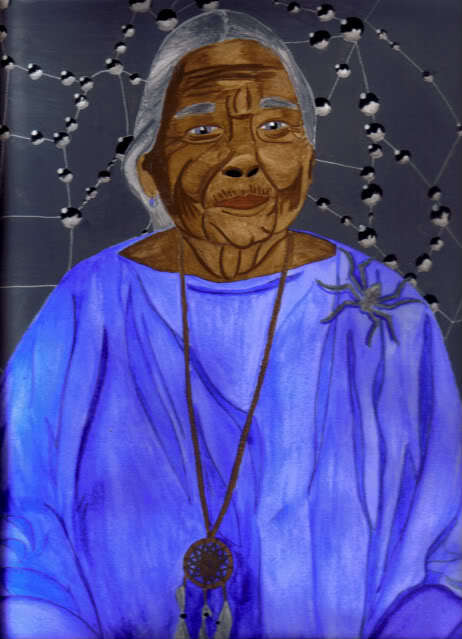 “Grandmother Spider is an important Goddess amongst the many Native American tribes. They call Her the “Great Teacher” and “The Creator of Life”. She has also been called ‘Spider Woman’ which is a metaphor for She who creates from a central source. Her webs represents the matrix of our societies. She is the guardian of everything that exists on Earth and uses Her magickal power to weave the fabric of time. Although She can occasionally be destructive, She is almost always portrayed the beneficent Goddess who created everything that there is with Her thoughts and dreams. It is She who brought the sun and the fire; She taught pottery, weaving, and the making of ceremonial magic. She created the Moon. Her legends are a part of the creation mythology for several southwestern tribes including the Hopi, Pueblo, and Navajo. One myth says that in the beginning of time only two beings were in existence…Tawa, the Sun God, who held all the powers from above, and Grandmother Spider, the Earth Goddess, with all the powers from below. In many murals, the Great Goddess is shown with many of the scurrying arachnids in the background, on her clothing, or hanging from her arms. 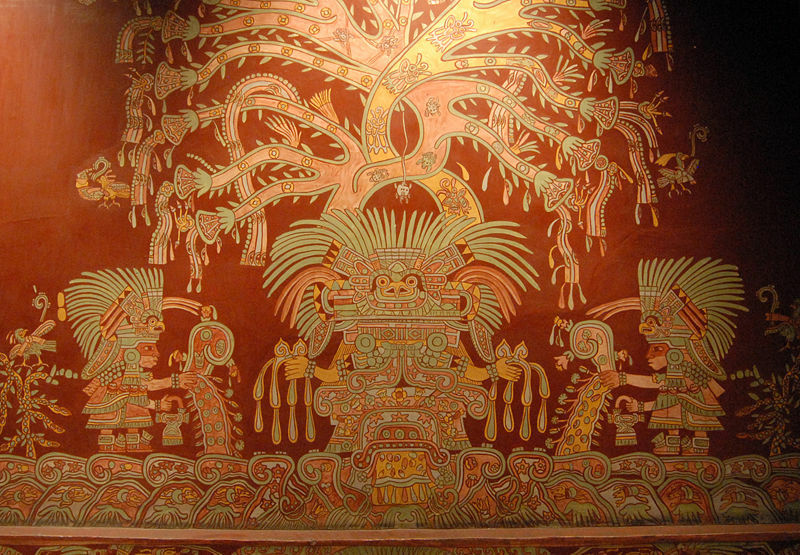 It has been concluded that the figures in these murals represented a vegetation and fertility Goddess that was a predecessor of the much later Aztec goddess Xochiquetzal. The Great Goddess is often seen with shields decorated with spider webs, further suggesting her relationship with warfare. Her nosepiece is the single most recognizable adornment of the deity, finalizing her transformation into the arachnid-like goddess. Mural from the Tepantitla compound showing what has been identified as an aspect of the Great Goddess of Teotihuacan, from a reproduction in the National Museum of Anthropology in Mexico City. In the Tepantitla and Tetitla murals, the Great Goddess wears a frame headdress that includes the face of a green bird, generally identified as an owl or quetzal. She is shown among several spiders and with a yellow body coloration, further distinguishing Her from other Mesoamerican deities. Her single most distinguishing feature is a nosepiece consisting of a rectangular bar with three circles. Immediately below this bar hang three or five “fangs”. The outer fangs curl away from the center, while the middle fang points down. If you’re interested in researching Spider Woman further, I highly suggest visiting Michelle Phillip’s site, Sacred Spirituality and read Spider Woman and Spider Symbolism. It packed full of great information, how Spider Woman has had an impact on her life, links to Spider Woman’s many stories and Native American lore.